What is better than spending several days in the wilderness? Maybe traveling on a canoe at the same time? This is known as canoe camping, which is also known as canoe tripping. Like ordinary camping, the campers tend to travel for long distances but they use a canoe instead of hiking or traveling by cars. Your canoe camping gear checklist should have all the necessary items that you need for having a nice and successful trip. Native Americans were the first people to use canoes for traveling. They needed to canoe camp regularly searching for new land or food. The canoe was an efficient way to travel long distances and so much more convenient than going through the bushes and forests of the wilderness. It is lightweight, easy to carry, fast and able to travel through different water bodies for long distances. It is also able to carry very large loads throughout the whole trip which is definitely a plus. 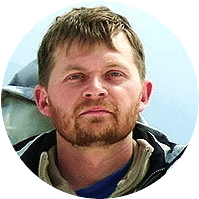 By time the use of the canoe spread throughout the world, where campers like to travel by exploring different water bodies like streams and lakes. 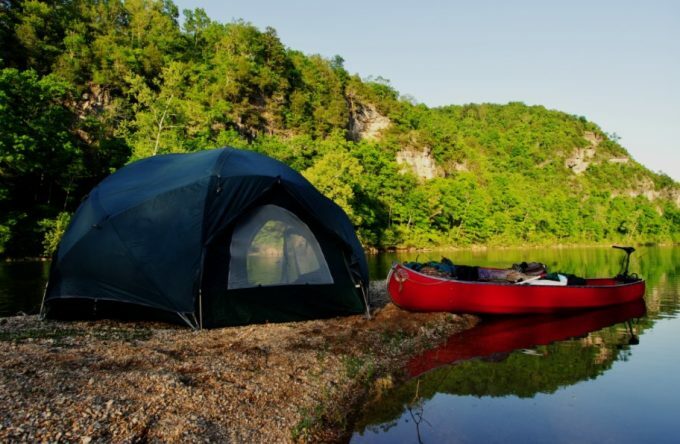 The United States still remains to be one of the most popular destinations for canoe camping in addition to Canada, Australia, New Zealand, Germany, Hungary and Poland. Canoe campers have the opportunity to carry more gear and equipment than backpackers since they don’t carry their gear all the time. If you are traveling using an appropriate canoe, you might be able to fit all your gear into the storage area without having to worry about a thing. 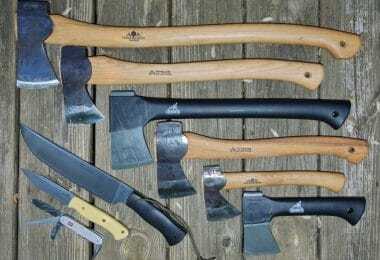 This also means that canoe camping trips can be longer with fewer problems. Campers will basically not have to worry about their gear even when they are going to sleep. They will just bring the canoe to land and everything will be set. But it is not all rainbows and butterflies with canoe camping. High water levels can be hazardous especially in bad weather conditions. Also traveling through rapids and waterfalls is not easy and sometimes the campers will have to go on foot. 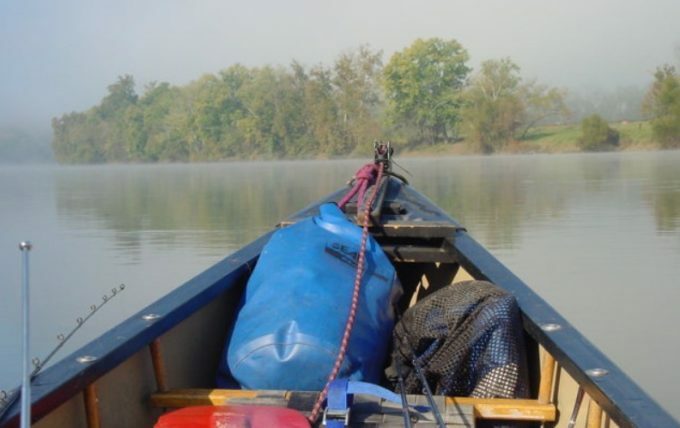 Understanding the constraints and the factors that can affect your canoe camping trip will have a great impact on the equipment and gear you choose to bring along. This trip will take you to the next level of inner peace as you explore nature and spend quality time in the wilderness or with your friends and family. But bringing too much or too little equipment can affect the success of your trip. Your checklist will serve as a guideline to help you with choosing the right gear and equipment to bring along. There are a few things to consider when you are thinking of the things that you need to pack before you decide to canoe your way to nature’s beauty. Your trip duration is the number one factor that will affect your choice. 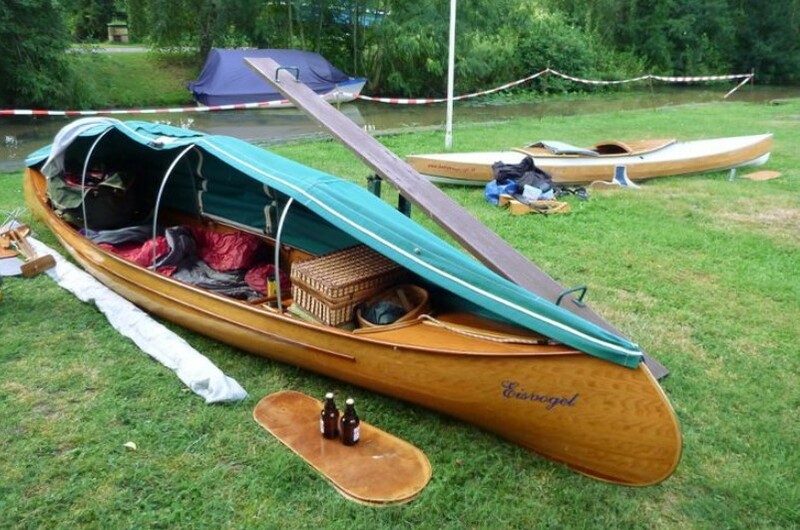 Of course, you will have enough space to store a lot of stuff in your canoe but you don’t really need to stuff it with unnecessary items. Canoes are designed to carry a heavy load but the heavier the load, of course, the slower your canoe will be. Also remember that every now and then, you will have to carry your gear and your canoe when you are traveling on foot rather than canoeing. Knowing how much time exactly you are spending will help you with understanding how much food, tools and clothes you need to pack before your trip. If you are going canoe camping with a friend, you might want to consider getting a tandem canoe. It is such a convenient choice as you can both switch carrying it and it will have enough space to fit all your gear and equipment. It is also a great idea especially if one of you is not very fit or tends to get tired easily as you can switch paddling. Since you are not traveling alone, you can also both split the gear and equipment you need to carry. After you have prepared your checklist, you can discuss splitting it with your partner to avoid cluttering your backpack and carrying a heavy load. Before preparing your canoe camping gear checklist, you have to decide where you plan to go and what exactly you plan to do first. This will definitely affect the equipment and items you want to bring along. If you are a beginner, you might want to stick with shorter trips where you tend to travel through smaller bodies of water. This will also mean packing fewer items. Big trips require big preparation and they are not for everybody. You should be experienced enough or traveling with an experienced camping guide to make sure that you are safe. Understanding the nature of the trip before you jump aboard is also great to avoid bad experiences. You need to make sure that the trip, activities and destinations really match with your preferences. As a rule, the trip should be suitable for the person with the least amount of experience in the group to avoid having a liability. It can also be a great risk if things get out of control. 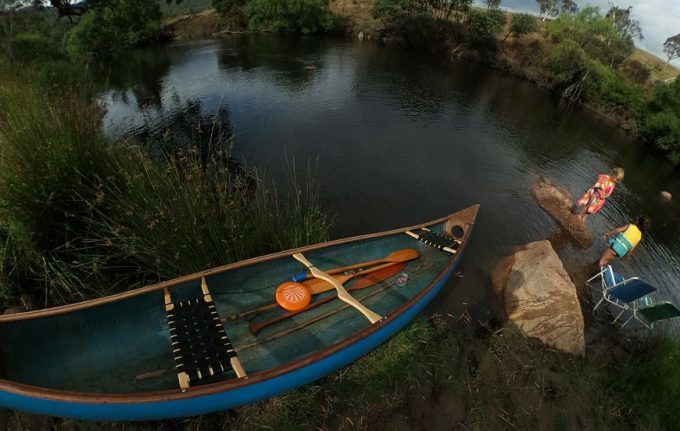 You might need to spend some time looking for the best canoe to take on your canoe camping trip. Choose a sturdy canoe that won’t let the water in and wet all your belongings and make sure that it is still comfortable to carry around. 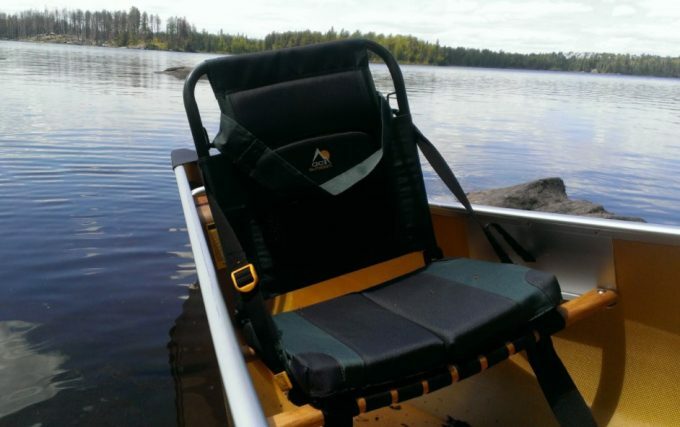 Most canoes have comfortable backseats or you can choose to install yours to avoid back pain. 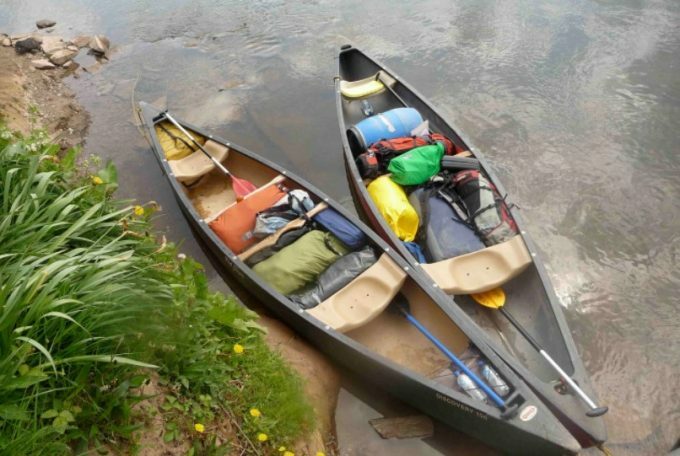 Campers can also choose to bring a tandem canoe that can accommodate two riders. These canoes are bigger and a tad heavier to carry but you can always alternate doing so. This means less equipment for everybody. You need to make sure that you have an extra paddle for each paddler because you never know what you might face on your trip. If you are planning to go fishing on your canoe tripping then packing your fishing rod, bait and other fishing gear is a must. Before you go canoe camping and regardless of your level of experience, you should always make sure that you are packed for safety. 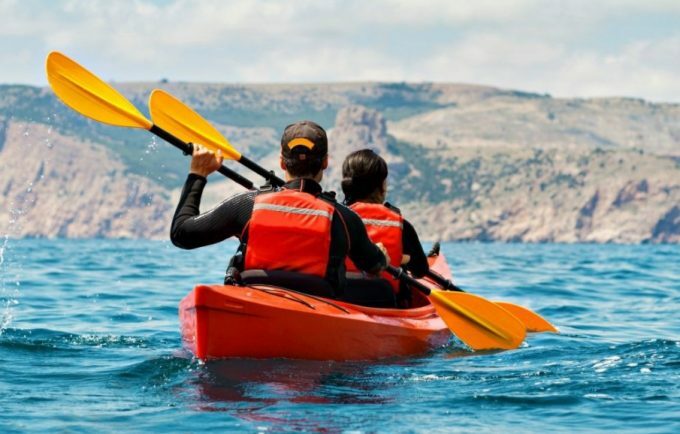 The canoe safety kit can save your life or the life of a loved one in case of danger and is something that you will never regret bringing along. Don’t forget your throw line, lifejackets, and whistle. Dry bags are a must for your gear organization. If you have a special organized space for sorting gear in your canoe then you are in luck. But sometimes you will just have to buy dry bags to keep everything separated and in place. You will also need a waterproof cover to through over your backpack or your canoe when you are on land, especially if it starts to rain. Having a signaling device is essential if you are traveling with a company to make sure that everybody is on the same track. You can bring on a mirror or flares so that nobody gets lost. Having a weather radio is also a great tool to have because it can warn you against extreme weather conditions before they happen. The number one thing that you should bring should be the right camping backpack. You need something that will fit all your equipment and keep your stuff organized. Having zippered pockets and different compartments will help you keep your stuff where you can easily find them. Make sure that your backpack is H2O compatible to stay well hydrated whether you canoeing or hiking. Your camping basics will differ according to your level of convenience, the length of your trip and basically your personal nature as a human being. But since we are talking basics here, human beings need to sleep and sleeping in your canoe is not the best or safest option. You will either need to bring your tent or your tarp if you don’t mind the vulnerability. 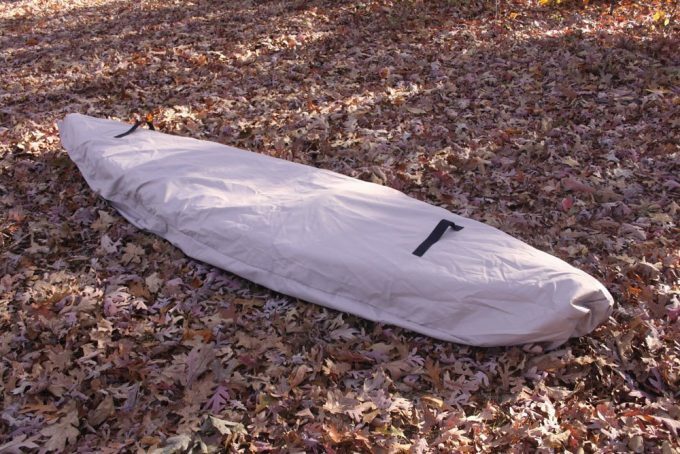 Some people would settle for a sleeping bag with or without a sleeping bag liner and it is all a matter of personal choice. Of course, a sleeping bag would be the lightest option but it might not be appropriate if you are sleeping on a rather pebbly ground. Your binoculars will help you see things afar and your camera is the perfect tool to keep those great memories alive. Instant cameras are just great to help you have your pictures printed on the spot, or you can opt for a digital camera for a better image quality. We know that canoe camping is all about getting in touch with nature, but some people would still want to benefit from the modern day perks especially when it comes to personal hygiene. Toilet papers, sanitizers, and soap can be your best friends on your time away from home. Check the option of bringing a sanitation trowel which can be a life savior for a lot. Packing the right gear and equipment will not just improve your camping experience but can actually save someone’s life. You should never go camping without your compass and map. Exploring the wilderness is something and getting lost in it is something else. Make sure that you keep them in a waterproof bag. 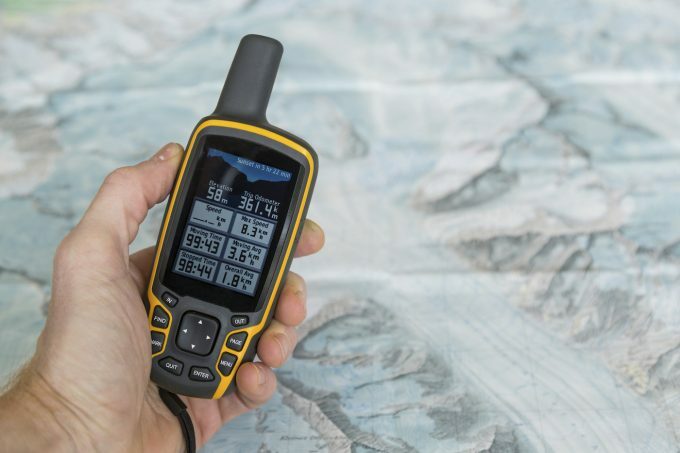 A GPS is another important electronic that might prove useful. It is a tad expensive but your dollars will be well spent. 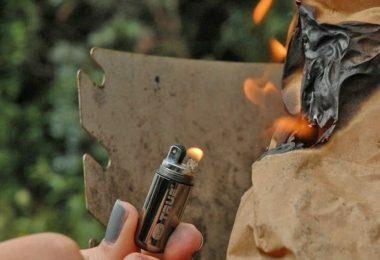 Your fire starter kit and matches will not just keep you warm and scare away the animals, but will also help you cook delicious meals. Make sure that you keep those, along with a portable lantern in a waterproof bag as well. 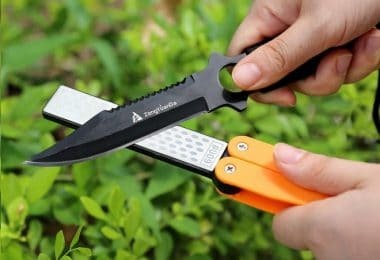 A multi tool or a knife will help you cut your way through bushes, cut ropes or open a tough can. A multifunction watch can be quite useful, especially if it is connected to your cell phone. Make sure that you keep your cell phone in a protective bag and don’t worry if it goes out of signal. You will have other tools that will help you stay connected to the world. Protecting your body is very important. Insect repellents work great especially on those humid summer nights. If you are allergic or suffering from any health conditions then it is of the utmost importance to bring your medications along. You should also inform your camping colleagues of your personal issue and how they should be acting in case of an emergency. 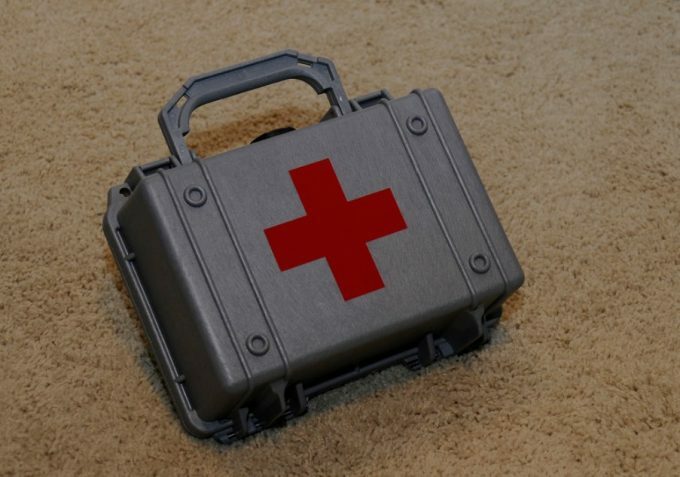 You should never ignore packing a first aid kit with all the necessary tools that you can use to stabilize a health condition before help arrives. Wearing a big hat and sunblock will protect you against sunstroke if you are going to spend the whole day paddling in your canoe. Having a water treatment system is essential if you plan on spending a lot of time on your canoe camping trip. Carrying water bottles might be suitable for a day or two but you can’t pack enough water for a longer trip. Do you think that nature can provide you with all the food you need on a camping trip? True, but you need to be well informed about the different types of mushrooms, plants, and fruit. Sometimes nature can be a sneaky enemy giving you things that look good to the eye but are actually poisonous. On a less dramatic note, they can be unsuitable to use or cause allergies and you might be better off bringing your own food with you. There are a lot of nice options to bring along if you are planning to spend a day or two in the wilderness. Having a ready-made dinner on your camping trip might not be the most practical options, but instant meals are always suitable for a time in nature. All you need is some hot water and you are good to go. 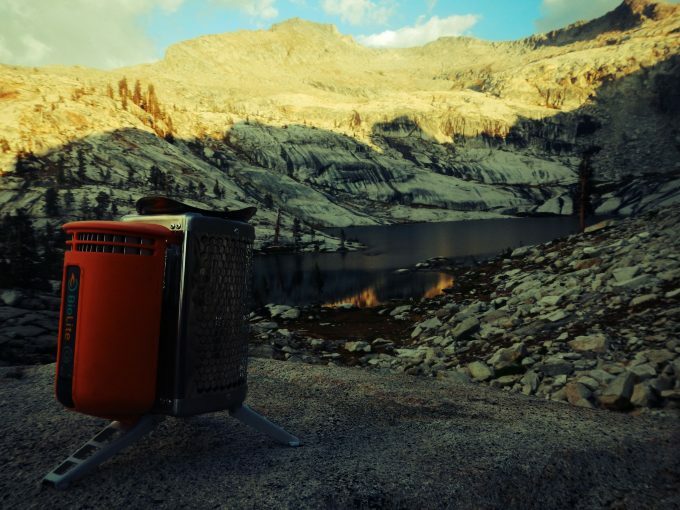 By doing a little online research you can buy a portable camping stove that can help you prepare the best meals. It is a must if you are planning to eat the fish you catch unless of course you are into eating raw fish. You also need to buy the necessary cook set, utensils, dishes and cups but you can choose to ignore packing them if you are really into the caveman experience. Energy bars, granola bars, dried fruits and nuts will give you the energy that you need for paddling without having to worry about the weight in your backpack. They are compact and packed with calories that will give you enough energy for long periods. Dried meat and dried vegetables can be consumed as is or you can add some water to prepare a delicious homemade-like meal. Tabs are crucial for your health by keeping your body nourished. Drinking water might not be enough to restore the electrolytes level in your body as you sweat all day. Some powdered drinks will also contain the necessary minerals to keep your body healthy and avoid dehydration. Bringing some spices or herbs to sprinkle over whatever you are cooking will add so much to your canoe camping experience. This is not the time to rock the runway, but you still need to dress for the occasion. Wearing the right clothes will help you stay protected and comfortable. You can choose to wear a dry suit while canoeing because it is waterproof, or your old comfy t-shirt in case you don’t mind having it getting wet. It is all a matter of preference and is directly related to the weather. The dry suit can be a little uncomfortable if it is really hot. Wearing convertible pants that could double as shorts could be appropriate especially if the temperature tends to fluctuate between the morning and the night hours. A lot of people keep their skin exposed when it is hot but wearing protective clothing is crucial if you want to avoid sunburns. A long sleeved shirt will protect your body from the sun and will not cause too much discomfort if it is made from the right material. At night, you might want to put on a synthetic jacket for insulation. Having moisture-wicking underwear will help keep your body dry especially that chances are you will not have enough time to dry your body or clothing. Don’t forget to pack your swimsuit and towel. You will have plenty of time to swim. Paddling gloves will keep your hands protected as you spend all day paddling. They are great to protect your hands from blisters and injury. A helmet is a must have when you are canoeing to save your head from injury especially if you are canoeing your way through a waterfall. 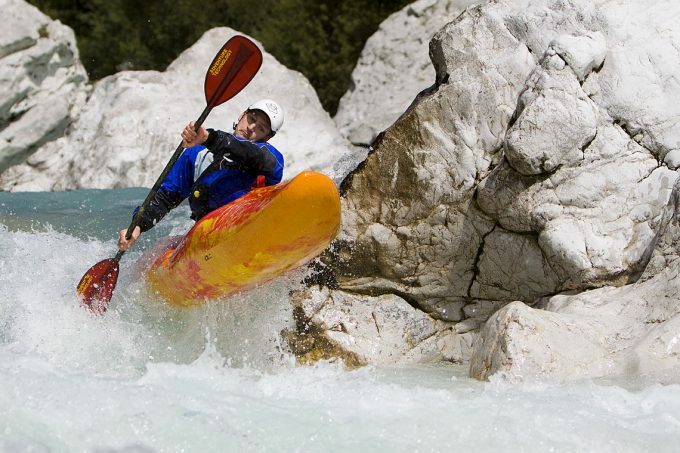 The right footwear for hiking might not be what you need when you are canoeing. Closed toe sandals, waterproof sneakers, and water shoes will help protect your feet as you paddle for hours but you might want to change into something more comfortable and more suitable for hiking when you are not spending time in your canoe. 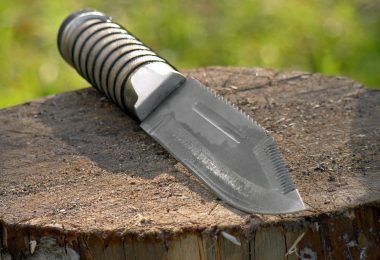 Of course, you are not expected to do massive repair tasks while going on your canoe camping trip, but sometimes there are a few things that you can do to fix a minor problem. A waterproof sealant will help you seal any holes or cracks in your canoe in case there is a little leak. If the leak is too big, then it is advised to call the trip off to avoid the bad consequences. 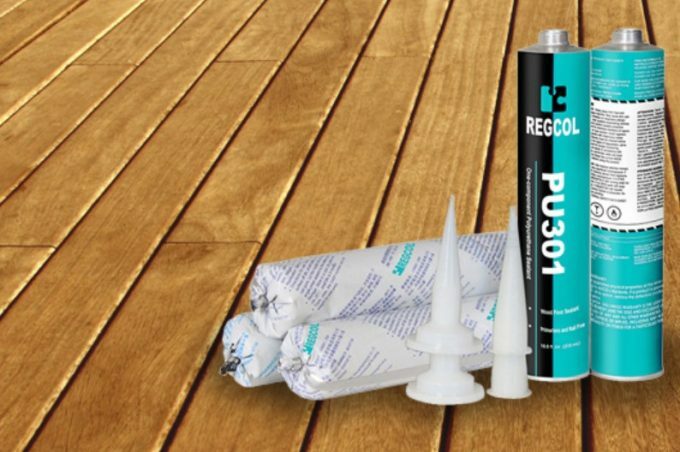 The sealant can also work to fix a minor problem in your tent. You might also need to pack a few replacement bolts to make sure that everything stays in place. A duct tape will help you secure your gear if things tend to get shaky. You might also need to pack a nylon cord that will not get soaked with water to help you tie everything together. It might seem that it is hard work to prepare this canoe camping gear checklist, but the truth is that you will never be sorry you did. You can never be over prepared when it comes to discovering new terrains. Even if you have been canoeing forever and are an experienced camper, no two canoe camping experiences will ever be the same. There is one factor that you can’t control no matter what; Mother Nature. So get your gear, get packing and get busy living.